Left: Barack Obama by Kehinde Wiley. Right: Michelle LaVaughn Robinson Obama by Amy Sherald. Photos courtesy of the National Portrait Gallery, Smithsonian Institution. 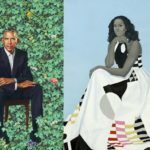 The National Portrait Gallery unveiled the latest additions to its Official Presidential Portrait Collections today: new paintings of former U.S. President Barack Obama and First Lady Michelle Obama. The portraits, by artists Kehinde Wiley and Amy Sherald, join a large collection of portraits on display of U.S. Presidents and First Ladies. The artists for these portraits were chosen by the sitters themselves. New York City-based Kehinde Wiley is known for naturalist paintings of African-Americans; his painting depicts Barack Obama seated on an ornately carved, mahogany-colored wooden chair against the green backdrop of a flowering hedge. The former President wears a dark blue suit, white shirt, and no tie, with his arms crossed over his widely spread knees – a classic look by the President, seen in numerous photos over his years in office. Michelle Obama selected Baltimore-based painter Amy Sherald for her portrait. 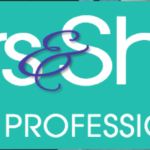 Sherald is a winner of the the National Portrait Gallery’s Outwin Boochever Portrait Competition, and known for creating portraits that contrast a grey palette used for the sitter’s skin with the vivid colors used for their clothing. Sherald’s painting follows this style, with Michelle Obama’s skin depicted in intricate grayscale in contrast to the vivid black and white with geometric highlights of her haltertop dress. 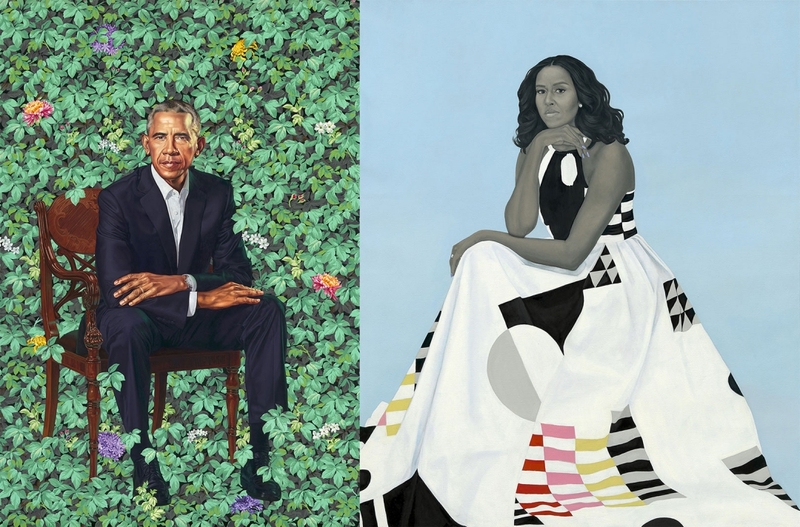 The composition of Sherald’s painting creates a pyramid effect, with Michelle Obama’s legs crossed underneath her dress’s flowing skirt in a casual expression of power. A robin’s egg blue gradient completes the background, pushing the eyes back to the sitter.